Chelanya falls on Kerea 22nd/August 1st. It is known as the Golden Festival or the Feast of Regeneration. 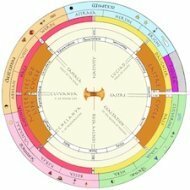 Chelanya is the first of the Mysteries of Life festivals – the great quarter-year cycle that runs from late summer to late autumn. 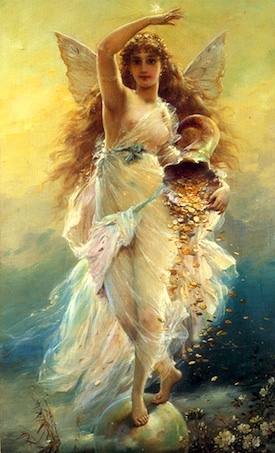 Since the Mysteries of Life Cycle inversely mirrors the Eastre festival (the actual three-day festival rather than the wider Eastre Cycle), this first festival mirrors the final day of Eastre, the rebirth of God the Daughter. 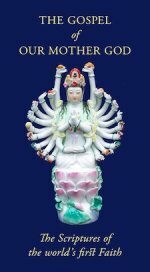 The Mysteries of Life Cycle reflects the microcosm of the Divine events on the human and earthly plane, and this festival is to some extent a "nature" and "harvest" festival. When we use terms like "nature", however, it is important to realize that all nature, both human and non-human, is a reflection of metaphysical reality. Harvest festivals, for example, do not exist because there was a physical harvest and people "invented" a meaning. Quite the reverse. The meaning of the harvest came first and then was manifested as a material phenomenon. Just as "numbers were before there were things to be numbered", so the mysteries of nature were before there were any physical phenomena to manifest them. Like to the corn my body was cut down by the scythe of death and like to the corn did it rise anew, for I am the ear of corn that is reaped in silence. The Daughter's death and rebirth is the Archetype of all death and rebirth. So the Golden Festival is the reflection of that highest Archetype in human life and in nature. It is the festival of first fruits – of the corn both as the harvested End and as the corn to be planted in order that the cycle may continue. In the life of maid it is the festival of our constant rebirth on the Wheel of Werde, and also of our spiritual regeneration as children of our Mother, redeemed by the Daughter. So the Golden Festival actualizes Regeneration on three levels, the natural, the human, and the spiritual, and on each of these levels it reflects the pattern of birth, death, and rebirth. On the most macrocosmic level, this reflects the out-breathing of the cosmos from the Dark Mother, its inbreathing at the end of time, and the future re-creation of being. Thus, on a certain level, it is the festival of the Divine Play (Lithla): the apparently causeless flow and reflow of being. In its Golden nature, it also mirrors the time of the first Creation when all things were golden and when the Mother causelessly laughed all the world into being out of the "superabundant joy" of Her divine Heart. The overwhelming "sense" of this festival is its "goldenness", its manifestation of the Solar Mother. The corn (meaning here all grain, not just what we normally call corn) has three sources for its being – the nourishing earth, the holy rain from heaven, and the golden, all-Mother Sun. The deep earth "from whence all comes, whereto all must return" is the focus of the next of the Mysteries of Life festivals, Cuivanya: the Feast of Divine Life. This is the Dark Mother who can truly be called the "Earth Mother" if we can free ourselves of all the materialistic interpretations of "earth" as a material phenomenon and understand Her as the metaphysical Ground of All Being. The holy rain is like the Daughter, and She is really most represented in the opposite half of the year, from Nativity to the Exaltation. The third element that sustains the corn is the Golden Sun – the Solar Mother – and this is the central theme of the Golden Festival. We offer the First Fruits to Her and partake of them ourselves. We celebrate the golden bounty of Her creation. That is why it is called the Golden Festival. The foremost physical symbol of the festival is grain of all kinds, but also all other fruits and flowers.